” The Emissary” is now on the shortlist for the National Book Awards! 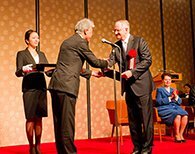 Every year since 1973, the Japan Foundation has presented the Japan Foundation Awards to individuals and organizations that have made significant contributions to promoting international mutual understanding and friendship between Japan and other countries through academic, artistic and other cultural pursuits. This year marks the 47th year of the awards. Yoko Tawada was born in Tokyo in 1960, educated at Waseda University and has lived in Germany since 1982, where she received her Ph.D. in German literature. She received the prestigious Akutagawa Prize for The Bridegroom Was a Dog. She writes in both German and Japanese, and in 1996, she won the Adalbert-von-Chamisso Prize, a German award recognizing foreign writers for their contributions to German culture. She also received the Goethe-Medal, an official decoration of the Federal Republic of Germany and the prestigious Kleist Prize (2016).